I was introduced to Taiwanese shaved ice at the ever-popular Class 302 near my college, UC Irvine. Seeing people come out of this restaurant with mounds of icy goodness to share with friends always intrigued me. Although I was on a mission to try the shaved ice, I opted for the shaved snow (photographed below) instead. Rather than having a snow cone consistency, shaved snow is made of thin sheets of flavored ice. My chosen toppings included strawberries, mango, mochi, caramel egg pudding, and condensed milk (of course), all of which were very delicious and pleasing to the palate. Sadly, you can’t make shaved snow without a special machine. 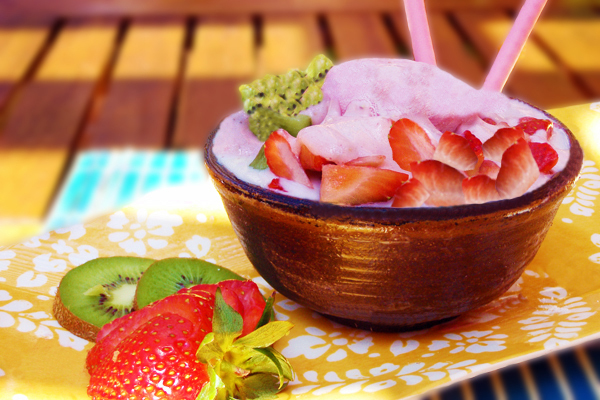 However, you can make shaved ice with a blender! Simply blend some ice with a little bit of condensed milk, pour some flavored condensed milk on top, then go wild with toppings. I was in a tropical mood, so I made strawberry-kiwi shaved ice topped with strawberry mochi ice cream (a must-have topping!) and strawberry Pocky. Other typical toppings could include your favorite chopped fruit, cereal, nuts, cookie crumbs, boba, azuki beans, coconut jelly, or grass jelly. 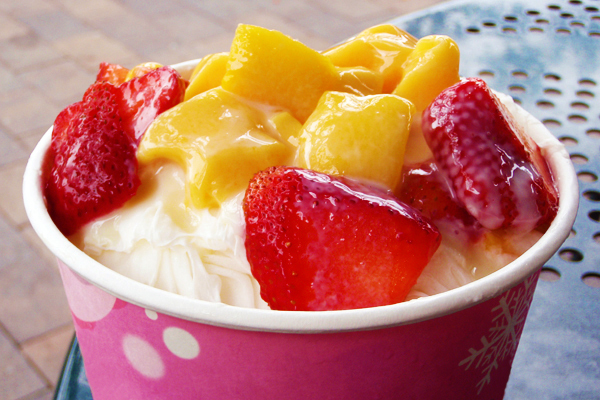 A lot of the traditional toppings can be found at your local Asian supermarket, or you can even score a few from Yogurtland! No matter which direction you choose to take this Taiwanese dessert, just make sure the consistency of your shaved ice isn’t too chunky or liquidy. 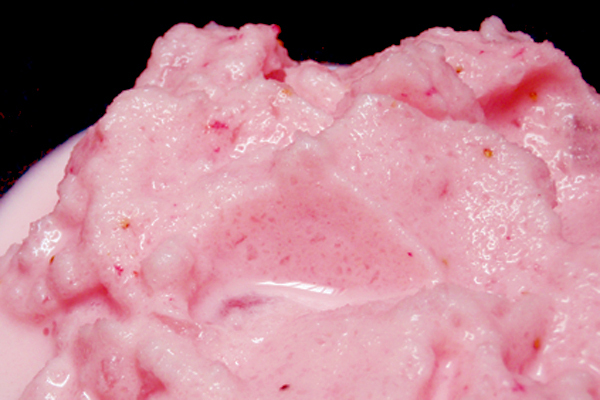 You want to achieve a sorbet-like texture, as pictured below. And don’t forget: Eat up before it melts! Puree six strawberries with 1/4 cup condensed milk in a blender. Remove from blender and set aside. Add ice cubes and remaining condensed milk to the same blender (no need to clean the blender in between steps). Blend until there is a smooth, icy (not liquid) consistency. Pour into a serving bowl. Drizzle the strawberry-milk sauce and top with remaining chopped strawberries, chopped kiwi, strawberry mochi ice cream and Pocky. Serve immediately! Çok teþekkürler admin sayende aradýklarýmý adresinde buluyorum. lett mee to grab your fsed to keep up to date with forthcoming post. Thawnks a million and please continue the rewarding work.